My classes usually comprise 4 students but special days with up to 5 friends can be arranged. 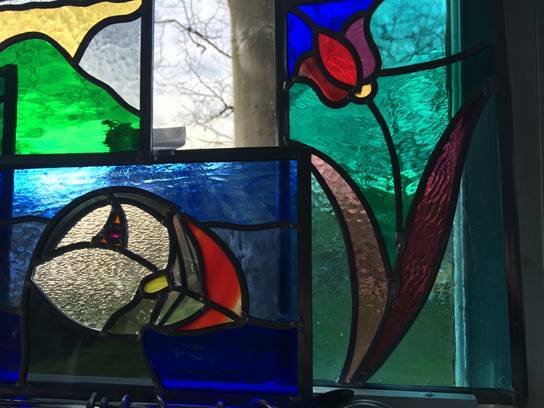 This one-day course introduces you to the medieval craft of making leaded panels. You can choose from a selection of patterns here or come with your own design. Have a look at some of the examples on this page to give you an idea of what’s achievable in a day. A maximum of 15 pieces in your panel is my tried and tested formula and A4 size. We will start the day with a cuppa and a chat and looking at our designs. Then you will produce your full size working drawing called a cutline. You will learn how to cut glass and then I will let you loose on my glass racks! Choosing from a wide variety of colours and textures will make your panels really special! Essential elevenses with biscuits and tea or coffee will keep us going for the rest of the morning. We will have lunch at about 1.00pm and then we finish our glass cutting. 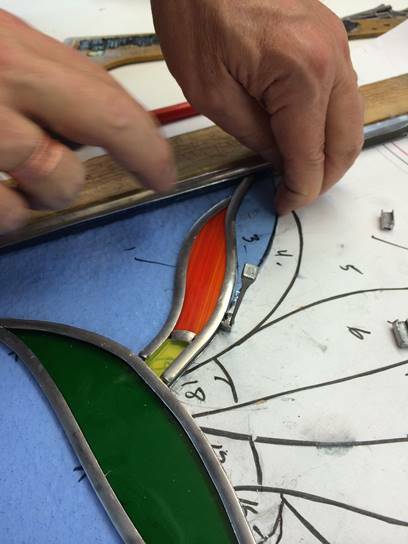 Following this I teach you how to bend lead, lead the glass together and finally how to solder the joints. Before you go I will instruct you in the final cementing and polishing process. I will do this for you and your panels will be ready for collection within the week. Please be prepared to stand for long periods of time. Pregnant women and nursing mothers unfortunately cannot work with lead. Please bring your lunch with you. Tea coffee and biscuits are provided throughout the day. There is a lovely farm shop in Abinger Hammer and they have fresh daily deliveries of cornish pasties (veggie too) bread and cakes so do pop in if you need to buy some lunch! Your day will start at 9.15 and finish between 5 and 6pm. 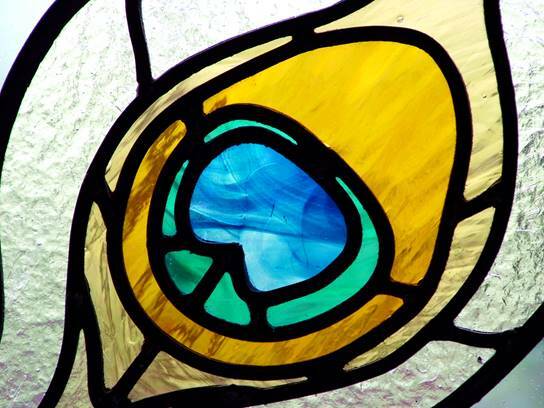 No experience necessary, my stained glass course is suitable for beginners and improvers alike. Copper foiling can be carried out on this day too, just ask!